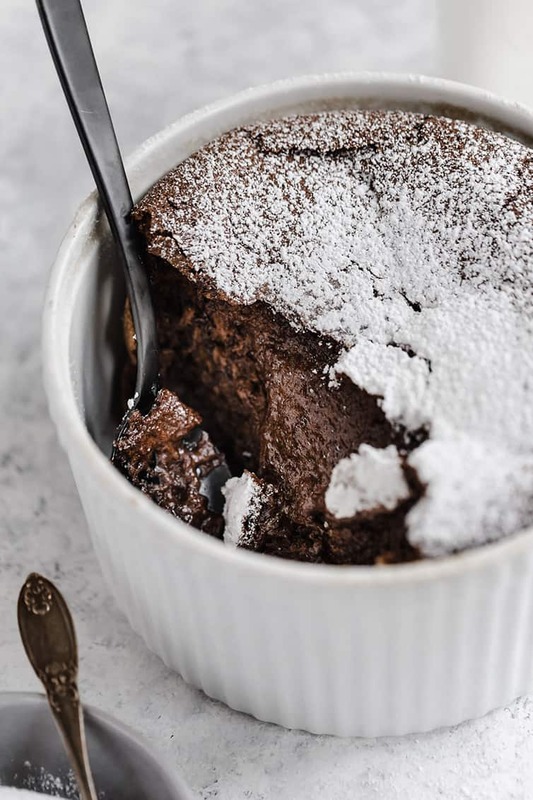 Chocolate soufflé can sound intimidating, but all you need is a basic list of ingredients and a little technique know-how, and you’ll feel like a kitchen all-star when you pull this dessert out of your oven. 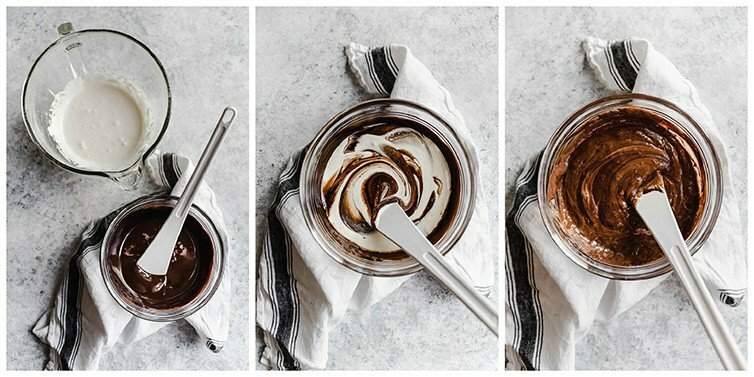 It’s light and decadent at the same time, plus you can make a large one or individual ramekins, and prepare in advance for an easy dinner party dessert. Welcome to the February Bake-Along! With Valentine’s Day coming up, I thought something a little chocolatey and a little decadent would be fitting. You all ROCKED the gougères in January, so I can’t wait to see you tackle these chocolate beauties! 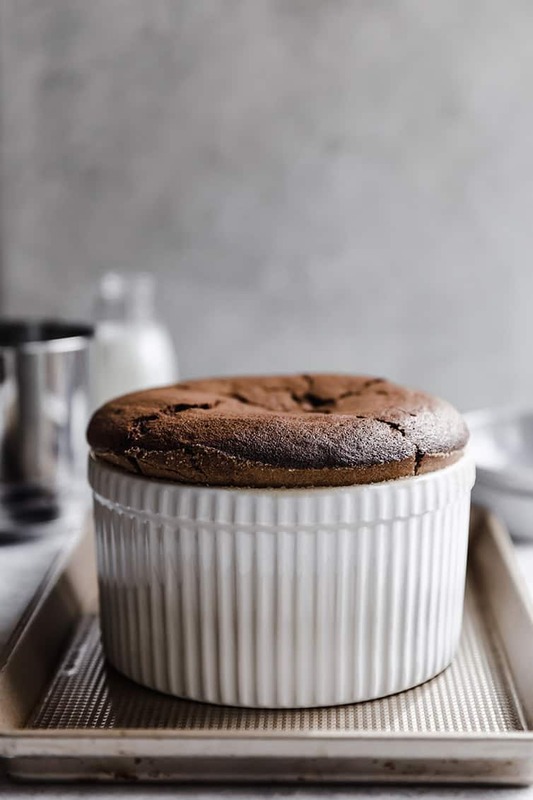 I had never made chocolate soufflé before, but I churned so many out of my kitchen over the last six weeks that at one point, my husband declared that he couldn’t eat anymore chocolate soufflé (I always had room for a little bit more chocolate, ha!). I tried different ratios of ingredients, different techniques, and finally settled on my very, very favorite version. And I LOVE it. I’ve included tons of information, tips, and photos below (as well as a video!) 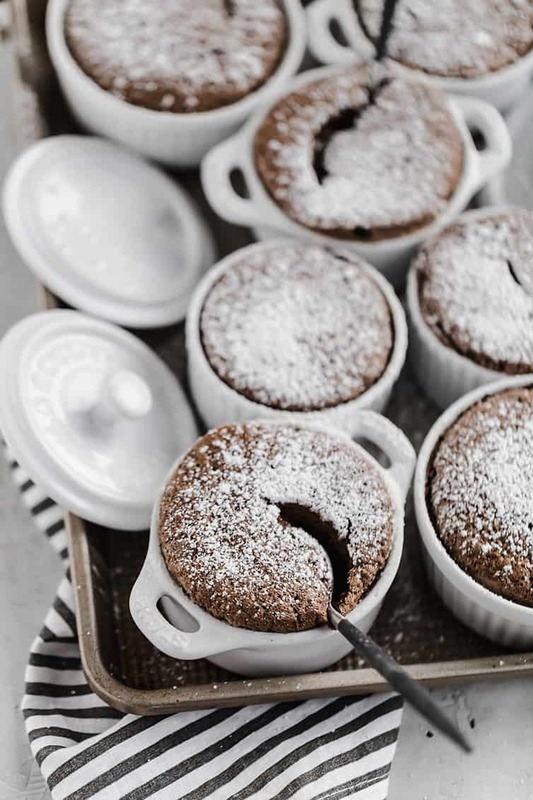 to help you rock your chocolate soufflé this month! A soufflé has a very basic set of ingredients, but the key to making a phenomenal soufflé is the technique which is used to mix them all together. Let’s discuss! Grease the pan and coat in sugar – MOST IMPORTANT! Coating the pan with sugar gives the batter sometime to cling to as it rises and prevents it from slipping down the sides of the pan. This allows the soufflé to keep rising and rising, getting above the rim of the pan. Melted butter and dark chocolate – This is the first step in putting the soufflé together, and while many recipes don’t include butter at all, I really liked using it to ratchet up the decadence level. It gives the center of the soufflé a ganache-like texture. Once it’s melted together, whisk in a little vanilla and a pinch of salt, then set aside to cool a bit. EGGS! Eggs are the key to the castle here. You need to work with the eggs in two steps. First, we are going to mix together egg yolks with sugar and beat it until it’s really thick and very pale yellow, almost ivory in color. This takes a good few minutes, and helps to set the stage for all of the volume we’re trying to get into the batter. Then, we’ll fold in the melted butter and chocolate mixture with the egg yolk mixture and set aside. Next we’re going to beat egg whites with cream of tartar and a little sugar until they reach stiff, glossy peaks. Once they’re ready, a quarter of the mixture gets stirred into the egg yolk/chocolate mixture to loosen it up. Then the rest of the egg whites are added and we very gently fold them in, taking care to be easy so as not to deflate the whites – they are the key to that amazing rise we’re going to get in the oven. 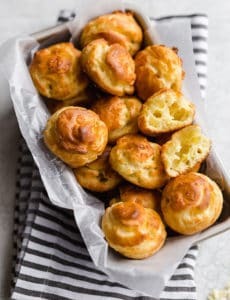 At this point you can put the batter into a 2-quart soufflé dish or individual ramekins and run a finger in a circle through the batter (it helps with an even rise! watch the video below and see the photos for an illustration) and pop in the oven. How Will You Know When the Soufflé is Done? Important, right?! You want to make sure it’s done enough so you don’t end up with a soupy center, but not overdone with burnt edges. I found that when the outer part of the soufflé is completely set and the center still jiggles juuuuuuuust a tiny bit, then it’s a good time to take it out of the oven. Your soufflé WILL fall about 5 to 10 minutes after it comes out of the oven, so don’t panic and think you did something wrong. It’s the sheer force of gravity; the hot air in the oven is keeping that delicious chocolate dessert nice and high, but once it is removed, it will start to shrink back down. Not worry about the soufflé sinking but fill the cavity with something delicious like ice cream, whipped cream, creme anglaise, and/or a caramel sauce. If you make a single large soufflé, scoop it out into serving dishes without worrying about how it looks. 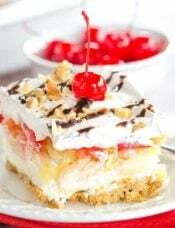 At some restaurants, they will take two forks and split open the top of the soufflé and pour in a dessert sauce prior to serving (this sounds phenomenal!). What Does Chocolate Soufflé Taste Like? Seriously though, I love that it has multiple layers of texture going on. The outermost layer of the soufflé is caked in a sugar from the coating on the pan, giving it a sweet crust. The next layer is light and airy, almost sponge-like. Finally, the center is a firm, yet creamy texture that melts in your mouth. You may be wondering if there is a big difference between making one large soufflé and multiple individual soufflés in ramekins… well, after tons of trial and error, my official personal preference is an individual soufflé. While both are delicious, I like that you can really get a sense for the varying textures when you eat a smaller one, versus a scoop out of the larger dish. You will need either a 2-quart soufflé dish or individual ramekins (you can use whatever size you like, but I think 8-ounce ramekins produce a nice size individual dessert). You can substitute milk or semisweet chocolate for the dark chocolate. All of the mixing can be done by hand with a whisk, but will take some elbow grease! If you prefer a lighter dessert, you can reduce the amount of butter by half. 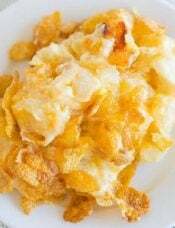 To cut this recipe in half, use 3 egg yolks and and a 1-quart soufflé dish (or 4 to 6 ramekins). Chocolate soufflé can be made ahead! Prepare the batter, transfer into the soufflé dish or ramekins, cover in plastic wrap and refrigerate up to 1 day. Bake as directed. 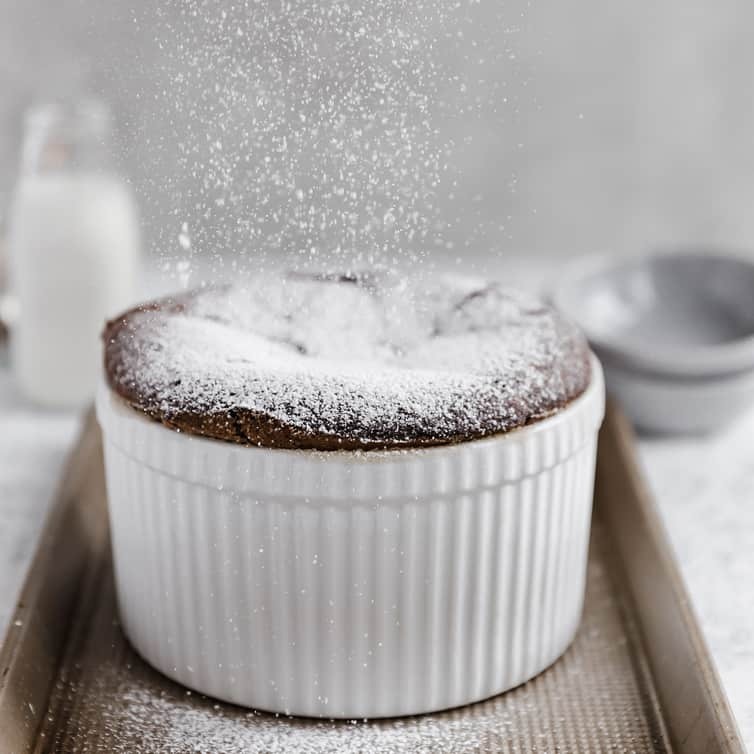 Soufflé is best served immediately to get the full effect of the varying textures, but leftovers can be covered and kept at room temperature for up to 3 days. They settle and become a little more dense, but are still oh-so-delicious! Snap a picture and either share it on social media (#BEBbakealong on Instagram or Twitter), upload it to the BEB Facebook group, or email it to me. Check in on Instagram and Facebook throughout the month to see everyone’s soufflé! And a quick reminder that you can sign up for special Bake-Along emails – be alerted to new recipes, receive troubleshooting tips, and end-of-month recaps (you’ll receive a few emails per month) >> CLICK HERE TO SIGN UP! 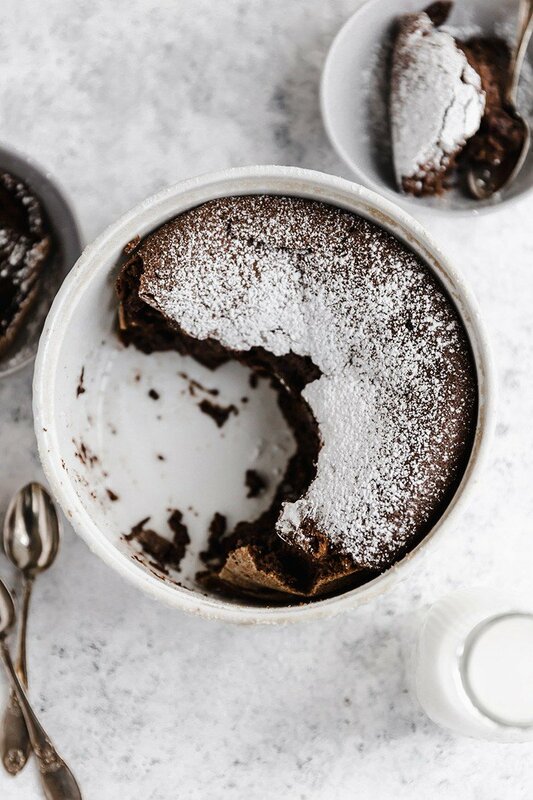 Alright, chocolate soufflé… YOU CAN DO THIS! Grab your butter, favorite chocolate, some eggs, and hit the kitchen! Chocolate soufflé is light and decadent at the same time. Make a large one or individual ramekins, and prepare in advance for an easy dinner party dessert. Preheat oven to 375 degrees F and adjust the rack to the lower-middle position. Generously butter a 2-quart souffle dish (or eight 8-ounce ramekins), then sprinkle with granulated sugar, tapping and turning the bowl until the sugar has completely coated the butter. Place in the refrigerator until needed. 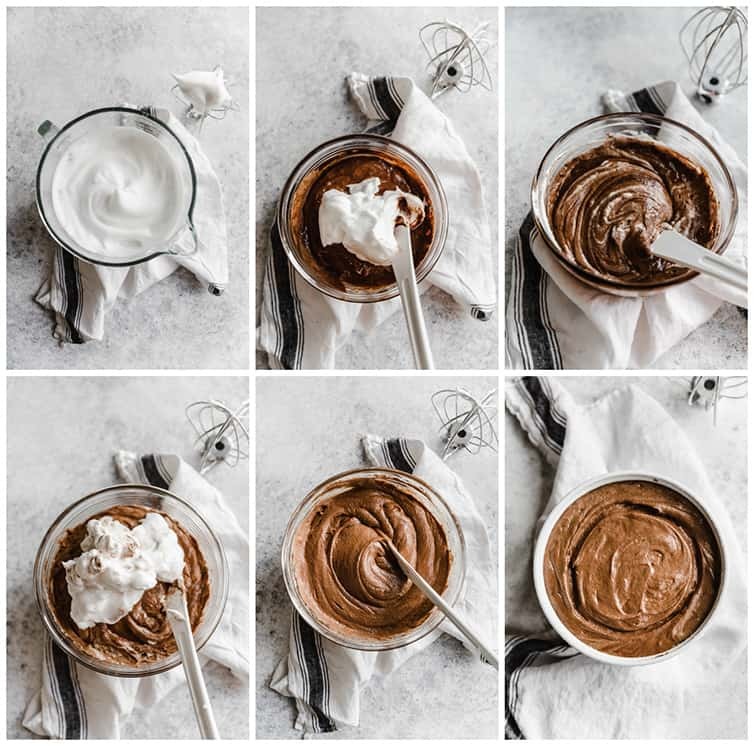 In a medium heatproof bowl, melt together the butter and dark chocolate (microwave on 50% power, stirring every 30 seconds OR place over a small saucepan of simmering water, stirring occasionally until melted). Off heat, whisk in the vanilla extract and salt; set aside. Using an electric mixer on medium speed, beat the egg yolks with ⅓ cup of the sugar until the mixture is thick and very pale yellow, 3 to 4 minutes. Use a rubber spatula to gently fold in the chocolate mixture; set aside. 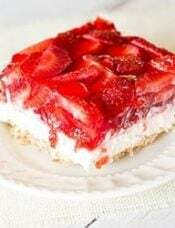 Using an electric mixer on medium-low speed, beat the egg whites and cream of tartar until frothy. Increase the speed to medium and beat until soft peaks form. 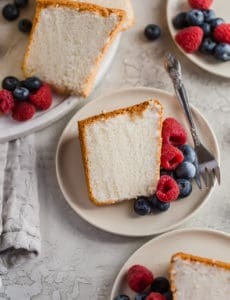 Increase the speed to medium-high and gradually add the remaining 2 tablespoons of granulated sugar; continue to beat until stiff, glossy peaks form. 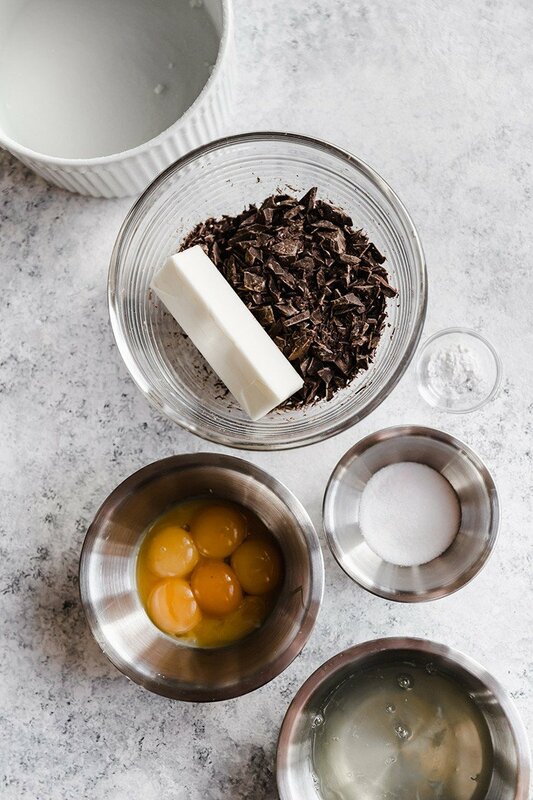 Add one quarter of the egg whites to the chocolate mixture and vigorously stir it in to lighten up the mixture (the chocolate egg mixture will have thickened a bit). Add the remaining egg whites all at once and use a rubber spatula to gently fold them in until no white streaks remain. Transfer the chocolate mixture to the prepared souffle dish and smooth the top into an even layer. Trace a circle with your finger in the batter about ½-inch from the edge of the pan (this will help give it a nice even rise). 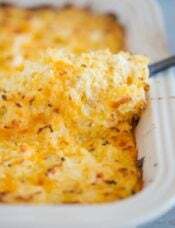 Place the souffle dish on a rimmed baking sheet and place in the oven. Bake until it has fully risen, the outside is set, and the center just barely jiggles when the pan is moved, 30 to 40 minutes (20 to 25 minutes for 8-ounce ramekins). Remove from the oven, dust with powdered sugar, and serve immediately. You will need either a 2-quart souffle dish or individual ramekins (you can use whatever size you like, but I think 8-ounce ramekins produce a nice size individual dessert). To cut this recipe in half, use 3 egg yolks and and a 1-quart souffle dish (or 4 to 6 ramekins). Chocolate souffles can be made ahead! Prepare the batter, put into the souffle dish or ramekins, cover in plastic wrap and refrigerate up to 1 day. Bake as directed. 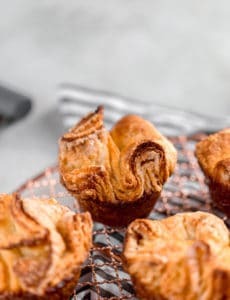 Souffle is best served immediately to get the full effect of the varying textures, but leftovers can be covered and kept at room temperature, covered, for up to 3 days. They settle and become a little more dense, but are still oh-so-delicious! I did a half batch with duck eggs and 72% chocolate. It turned out perfect. Not to sweet, and a fabulous texture. Thanks for the wonderful recipe. This was easy and great! I actually made this in early February but forgot to post it! Thank you! This will be a ‘regular’ recipe! 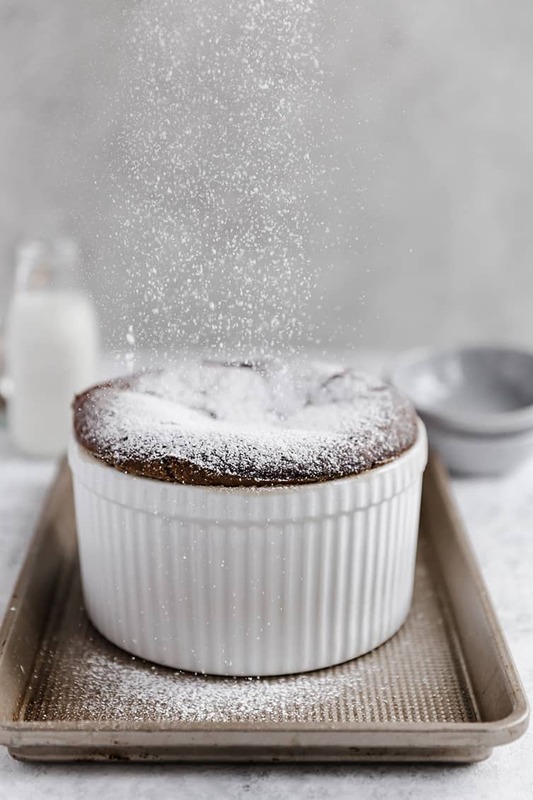 Souffles are some of my favorite desserts. Grand Marnier is my favorite, but I love chocolate too. I wish more placers served them. Many people are actually not familiar with them. For some reason they’s gotten the reputation of being difficult to make. I had so much fun making the Chocolate Soufflé from the this month’s Baking Challenge. I’ve never made it before, I was always afraid it’d come out flat. It came out beautifully!! I feel liberated, I feel fearless!! Ok, a little over the top, but seriously, I am super excited I was finally able to make this decadent dessert!! Woo hoo!!! Should the inside be liquid like, dry or like custard? I’m going to prepare the soufflés ahead of time (tomorrow), and bake them Thursday for dessert. I’m making half the recipe, as I don’t need a large amount. For the half recipe, you said to use 3 egg yolks. This may seem logical, but Since the whole amount is 8 egg whites, would I use 4? I’ve made chocolate – Grand Mariner soufflé before, and it’s heavenly. Can’t wait to make this one! Where can I watch the video? There is a pink link at the bottom that says Chocolate Souffle. Watch how to make it, but it won’t open and I can’t find anywhere else to click for a video. If you have an adblocker on, you won’t be able to access the video. Turn it off, reload the page, and you’ll see where to watch the video. Thanks, did not know that. Will give it a try. You read my mind! 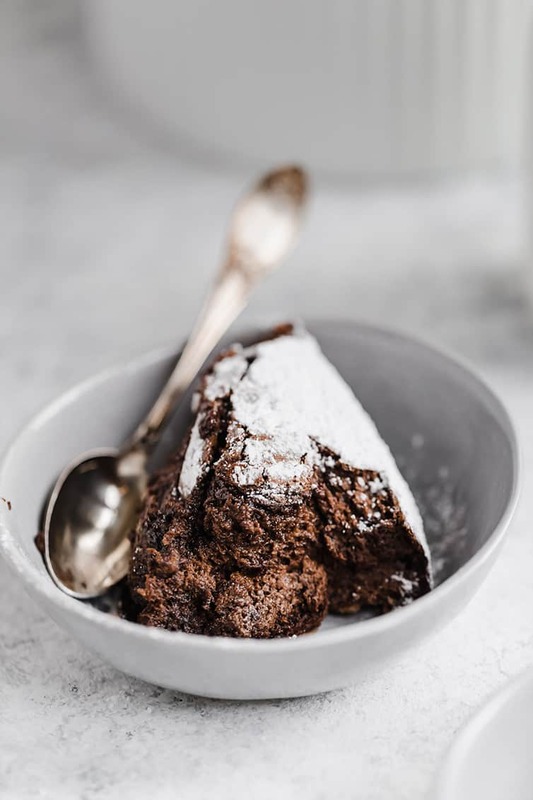 I was just thinking about a special Valentine’s Day dessert to make for my husband (Mr. “Is there any chocolate in the house?”) and I thought about chocolate souffle! 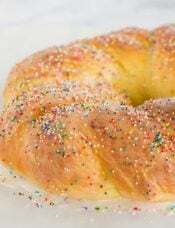 I’ve never made one but they’re delicious and seem special occasion. Thanks for the step-by-step instructions. If you cut the recipe in half how much chocolate and butter do you use? You soooo have to do the creme anglaise w soufle… it is almost the best part of getting to enjoy a chocolate soufle… and we soooo have similar tastes in foods…be still my heart when I saw gougeres… then chocolate soufle….I just need to buy the ramekins. Is there a brand you prefer or is any ramekin just fine? This is a pretty random question, but has anyone heard the rumor that corn meal is no longer going to be made? There’s a rumor going on that because the corn crop has been so bad that there isn’t enough to make it anymore and will soon become completely unavailable. 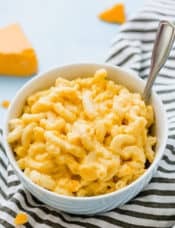 What would be an alternative for corn meal in baking/cooking if that were true? Can I use dark chocolate chips for the dark chocolate? If I need dark chocolate bars, what % cocoa is best? There were several choices when I looked. Looking forward to trying this one. This looks so good which makes me excited to try it. You mention it can be whisked by hand but does it have to be for any reason? Thanks for all of the effort you put into your recipes, your blog and your readers . Is there a substitute for cream of tartar? I cannot seem to find that here (Switzerland), though it may just be that I don’t know what name to look for. Hi Julie, The cream of tartar helps to stabilize the egg whites and maintain those stiff peaks; you can substitute the same amount of lemon juice or white vinegar in its place. Enjoy the souffle!! I bet your chocolate is amazing!! I’m very excited to try this challenge. Do the ramekins bake for the same amount of time as the bigger baking dish? Hi Ilene, Can’t wait to see your souffle! The ramekins will bake for less time (for 8-ounce ramekins, about 20-25 minutes); I’ve updated the recipe to include that information. How many I 8oz ramekins should be prepared? And how full should they be filled? Thank you! Hi Shannon, You should be able to fill eight 8-ounce ramekins. They should be filled up to right under the rim (about 1/2 inch from the top). Enjoy!